This is an easy homemade version of the popular breakfast treat. 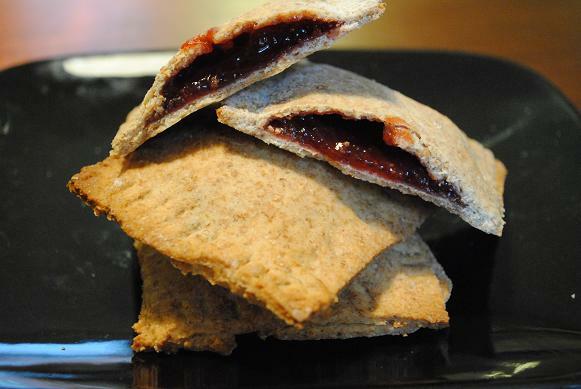 This Homemade Poptart recipe is far healthier than the shop bought version. One of my childhood food memories is buying a box of Pop Tarts (the chocolate fudge ones were my favourite) and eating one and then another, and then another, and then it would have been rude not to finish the whole box. It’s no wonder I became so overweight when I had that attitude. I could never just leave something. Even at the time I knew that they tasted artificial, but I didn’t care – they were convenient. Now I am older and more health concious, I see the importance of health over convenience and I have also learned that with a little bit of preparation, you can create your favourite convenience foods and store them so they are ready as and when you want them. The homemade Pop Tart is a good example of this. If you store them in an air tight container, they will last for a couple of days (if you don’t eat them before that), or you can freeze them after they are cooked. You can even freeze a ball of the crust dough so you can make them faster than you would if you had to make the dough again. So many options to make these a little bit quicker. But, even making them from scratch doesn’t take long and it is Oh. So. Worth. It. to have this unhealthy store bought treat made healthier. You can have them for breakfast, or even a snack. The reason these are “healthier” is because they are made with whole wheat flour, half the butter is replaced with yoghurt and they are sweetened with a homemade date syrup, rather that sugar. As with most things, they are so versatile too. 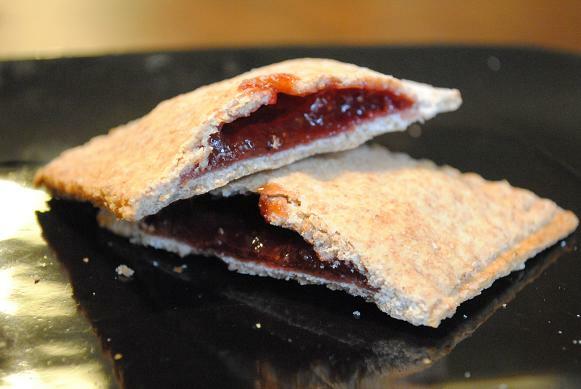 I made these with homemade strawberry jam , but you could put in whatever you like. Other fillings I use are peanut butter and jam, peanut butter and banana, stewed apple and cinnamon, mixed berries, and my homemade healthier Nutella . Drizzle a little dark chocolate on top if you want something a bit more indulgent. I am in the process of working on a recipe book and you can bet that these are going to feature in it! Put the water and dates in a food processor and blend to make a date syrup. Roll the dough out and cut into 24 equal rectangle shapes. Put 12 on a baking tray and add your filling (I used jam) to the middle of each rectangle, leaving a boarder. Using your finger, put some cold water around the edge of the rectangles and then put the other pieces on top. Using a fork, crimp down the edges to seal the Pop Tart. Bake in the oven at 200C/400F for 20 minutes. Leave to cool for a little while before eating. What other convenience foods would you like to see a healthier version of? Leave a comment below. I’m not a massive fan of poptarts in the morning but Dan eats them every single day! (Very dull!) I shall have to try making your healthier version with your version of Nutella in as it does worry me how many rubbishy processed foods he eats every day. I am not sure I could even eat these every day. let alone the processed ones. I went to a rather posh dinner once where they served pop-tarts – or a posh version of them. I’m not a great fan, but I can see that these are a great idea! An interesting thing to serve at a posh dinner. They look amazing. I can just imagine I would eat it too soon and burn my mouth. I’m going to crave these all day now. Loving your recipes Dannii! Yes, definitely the possibility of burning your mouth. Oh what a great idea, I used to love Pop Tarts! Ahh I did love Pop Tarts back in the day. But yeah they are full of rubbish. These sound great, far better and not full of nasty rubbish. It’s amazing how much rubbish is in all of the things I used to love. I firmly believe that it is possible to make a healthier version of almost anything. Healthy Nutella??? 😮 I could eat that straight out of the jar. How often do you have sweet breakfasts compared to something like eggs on toast? I subscribed yesterday and this was the first one that I got sent. Couldn’t be more perfect for me. Thanks! *Hands up* Pop Tart fan right here. I never thought to make them myself though. I love the sound of the chocolate and banana ones. Not a huge fan of strawberries.